A refreshing minty lime combo for your Thursday morning, have a great day! LOVE this look! Perfect to kick of spring!! Great color combo, especially for the first day of spring! What a beautiful and chic look. The shoes are amazing and I love that you picked this background to compliment the shoes and outfit. Great picture. Such a fresh and springy look! Love! LOVE those shoes. They are so dainty but so fun. I love this entire outfit, especially the skirt & bag! LOVE! i adore this! what a perfect spring look. and how perfect are those heels?! Absolutely gorgeous look, the color palette is divine! Love this color combo for spring! Oh my word – seriously I can’t pick a favorite item because they are all amazing. Love this minty combination. Perfect for the first day of spring. Gosh this is fabulous. Love those shoes and the colours of this outfit!!! those shoes and that bag together are perfection!!! Click here to visit Fiona Brooks Lifestyle for more Outfit Posts! Such a lovely spring outfit! You are gorgeous, and this matchy-matchy outfits is the perfect amount of matchy! WOW! I love the combination of this two colors! Perfect for spring! can’t get over those shoes! They’re so perfect, especially the heel height! Beautiful colors! These colors pair so nicely together and how perfect for the first day of spring. I absolutely am dying over these beautiful colors! So pretty Rachel! Those shoes are pretty amazing!! Love the mint and lime together. So bright and refreshing! Such a pretty pastel outfit!! Love this outfit, so perfect for spring. Oh. and the shoes are to die for! I love the fresh spring colors in your outfit! Perfect for the first day of spring! Wow, I loooove these two colors together. This is the most perfect outfit! Wow these two green colors look great together! So cute! You have so many things in neon and now I’m obsessed with it! This is the best spring outfit I have ever seen!!!! Everything is just PERFECT! Perfect look for the first day of Spring!!! This outfit is so spring perfect, I am loving the normal Spring colour palette of pastels, and the bright lime skirt is a great way to mix it up. I’ll definitely be drawing inspiration from this. Perfect spring look. I need to get me a skirt like this. So gorgeous. This whole outfit ties together nicely! I’m loving how the shirt and skirt (which are amazing on their own), work together perfectly with those heels! Loving the pops of pastels! That shirt and skirt combo is superb! I love this! You have now inspired me with other ways to wear my yellow skirt! So, thank you! Obsessed… that color combination looks so good on you!! Really love it with the pink lip. This look is very appropriate for the first day of spring! I absolutely love this outfit! Thank you for always posting gorgeous, modest outfits. I am a pastor’s wife with a love for fashion, and I obsess over your blog often because you always are very classy and fashion-forward without showing too much skin. Thank you! Love the fun citrus colors in this outfit!!! I never thought to pair lime and mint together until the other day when Kendi shared her look & I love the way you styled it here too! So cute! Beautiful colors, and you hair are fabulous ! Absolutely LOVE how your skirt and shirt match your shoes! Gorgeous look! Loving all the amazing spring colors! 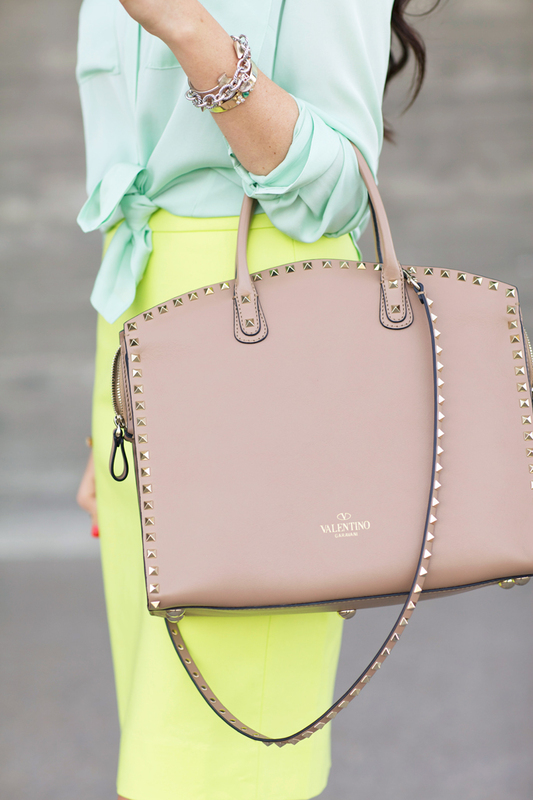 That Valentino bag is absolutely fabulous! Ok – I just want to say, I love this outfit. I strayed from PinkPeonies over the past year because the outfits seemed to all blend together and too old for her, but THIS, this outfit is killing it. Looking back at older posts I am loving the infusion of color & younger looks. The recent embrace of a more fun, colorful & youthful look is extremely refreshing and is fantastic to see as a reader! Cheers Rachel – keep it up! Also the makeup looks playful & fun, but young and natural! I’ll now be adding PP back to my daily blog roll. Love this mix of colors! Great pics for the first day of Spring. Those shoes tie everything together! Those Jimmy Choos are drool-worthy! Another of your delightful outfits my dear! Such a beautiful combination of colors, perfect to say hello to Spring! You look so ready for Spring, I love the colour combination! I love this entire outfit. Gorgeous colors. Well done. These colours are perfect together! You lokk stunning! Completely obsessed with this shoes!!! So cute!! I love it all! I love that color combo and those heels are to die for! I’m totally infatuated with those shoes! They’re totally a pair I would question purchasing because of the unique colors, but it’s outfits like this one that would not be complete without them. You’ve inspired me to step outside of my neutral comfort zone this season. What a perfect outfit for the first day of spring! Love the color combination. NEED that mint button down! I LOVE this combo! You are always looking amazing! And thank you for linking all of these amazing items! I’m definitely going to have to get a few of these…or all of them ha! Perfect outfit for first day of Spring. Love your heels! Love these color combo, I would never think to pair mint and lime together but it works so well! Wow! That is the first word that came to me after seeing this amazing look! The color combination is just gorgeous. The shoes are incredible and reinforce the color combination. The beautiful bag pairs so nicely with those shoes!! Great post, Rach! Love these colors – this is exactly what I’ve been looking for this spring – bright colors! Those shoes are amazing! You paired this outfit so perfectly too! 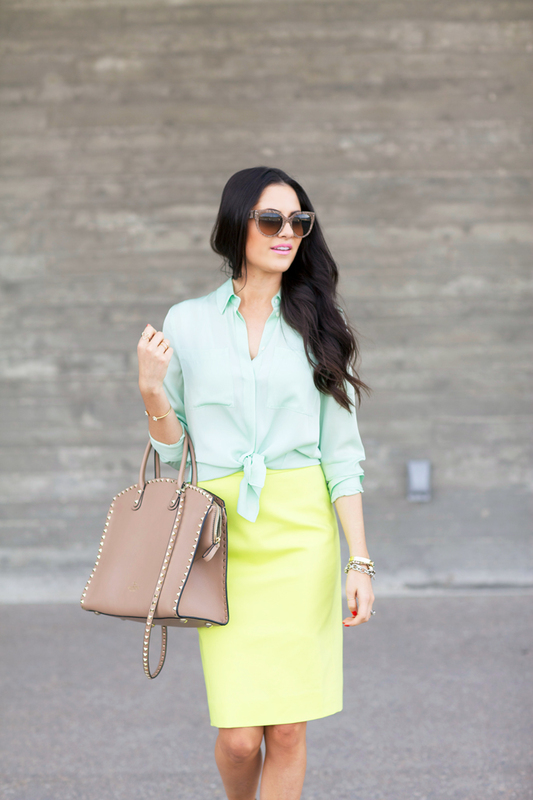 I´m a big fan of pencil skirts and this mint option is gorgeous! This color combination is divine!